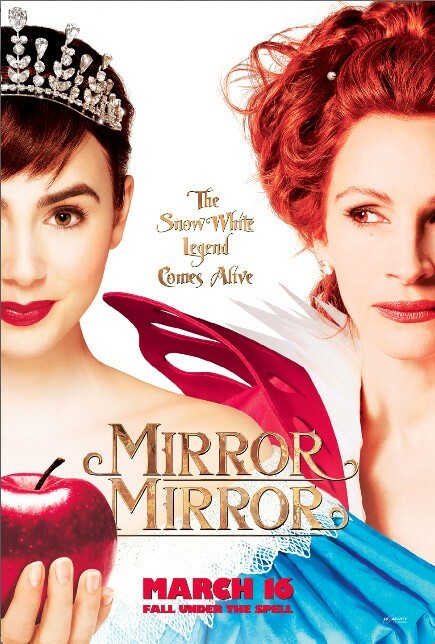 Mirror Mirror is the first of two interpretations of the Snow White fairy tale due out in theaters this year, and by all accounts this one strives to be the more whimsical of the two. Instead of the Grimms’ traditional cautionary tale that pits age against beauty, Tarsem Singh’s visual masterpiece attempts to dive into the realm of witty meta-commentary that starts off strong, but ultimately reinforces the same tired stereotypes it pokes fun at in the first place. The film begins with a rather interesting animated sequence (think back to Deathly Hallows: Part 1, and the Three Brothers tale) that gives us the back story: a beautiful princess gets an evil step-mother, the King disappears soon after in mysterious circumstances. Julia Roberts plays a rather delicious if slightly overdone Evil Queen, who is jealous of Snow White’s (Lily Collins) youth and beauty, and locks her away in the castle. Ever the sweet angel, Snow White obeys, until she hears about the horrible things that are happening to the townspeople under the Queen’s tyranny. She escapes, and with the help of the seven dwarves and Prince Alcott (played by the ridiculously charming Armie Hammer), she sets out to defeat the Queen. Lily Collins and Armie Hammer are the relative newcomers here, and both deliver strong performances on their own, but together, they lack the necessary chemistry to make their “fairy tale” romance a believable outcome given the campy dialogue and intentionally exaggerated caricatures of the characters they play. Even Roberts’ interaction with Collins lacks the passive-aggressive flair a la Mean Girls that it aims for. The only exchanges I really enjoyed were between Roberts and her minion Brighton (played by the always spot-on Nathan Lane). The real star of Mirror Mirror is Tarsem Singh who is blessed with an eye for the magical. Everything from the set designs to the costumes evoked the perfect blend of the bizarre and the enchanted, and when things didn’t quite click elsewhere on screen, at least there was always something nice to look at (besides Hammer’s pearly white grin). Mirror Mirror opens today in Philly-area theaters.